As fans of Lost will attest, it’s not a good idea to lift a hatch, open a strange door or move an odd object without having some idea of what might happen next. That could be the reason why residents and government officials are in no hurry to remove a seemingly unmovable starfish-shaped metallic object found about 10 feet offshore at low tide on East Beach in Westerly, Rhode Island. Has anyone checked it for numbers? It’s a bit of a mystery. The object resembles a starfish, but is made of concrete and metal. And at first, Peter Brockmann, the president of the East Beach Association, was afraid to touch it, worried that it might be a bomb. “We wanted to figure out what it is before we go tugging on it,” Brockmann told The Westerly Sun last week, adding that authorities are now pretty certain that it is not explosive. So what could it be? Brockmann contacted a number of places he thought it might have come from, including the U.S. Navy, a company building a nearby wind farm, and a local harbormaster Stonington Harbor Master Eric Donch. Donch says the object is not related to commercial fishing or other known harbor boating activities. Brockmann showed the photo to an unnamed U.S. Navy admiral who was baffled. 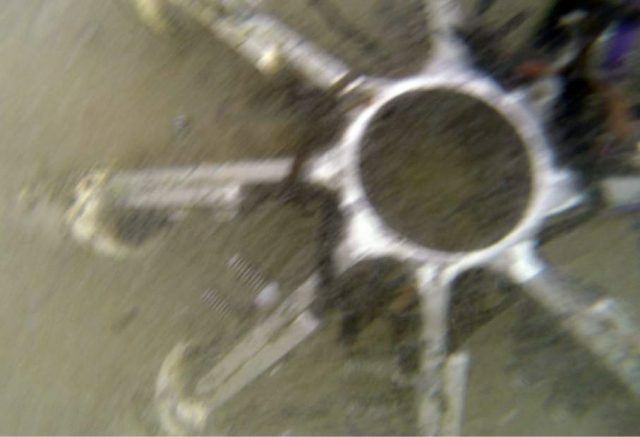 East coast waters are now filled with wind generators but the Deepwater Wind energy development group assured worried locals that the mysterious metallic starfish has nothing to do with its Block Island wind farm located 3.8 miles from Block Island, Rhode Island. That covers the usual suspects. Could the object be from some sort of secret government project? One suggestion is that it’s an almost-buried acoustic Doppler current profiler which would be used by the U.S. Army Corps of Engineers to monitor currents and sediment flow prior to dredging projects. Yeah, that must be it … except no one has heard of any such projects and no one remembers seeing anyone burying such an object on this busy beach.